Macular degeneration (MD) is the name given to a group of degenerative diseases of the retina that cause progressive, painless loss of central vision. This affects your ability to see fine detail, drive, read and recognise faces. Although there is no cure for MD there are treatment options that can slow down its progression. These options depend on the stage and type of the disease (wet, dry, and other forms). The earlier the disease is detected the more vision you are likely to retain. Both wet and dry forms of MD begin in the Retinal Pigment Epithelium, or RPE, a layer of cells underneath the retina. The RPE is responsible for passing oxygen, sugar and other essentials up to the retina and moving waste products down to the blood vessels underneath (these vessels are called 'the choroid'). 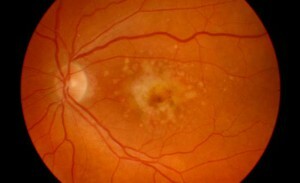 MD occurs when this "garbage collection" breaks down and waste products from the retina build up underneath the RPE. These deposits, known as 'drusen', are easily seen by your eye care professional as yellow spots. As MD progresses vision loss occurs. This is because the RPE cells die or because the RPE cells fail to prevent blood vessels from the choroid from growing into the retina. In the early stages of MD, when drusen first appear, you may not realise anything is wrong and you may still have normal vision. That is the best time to detect the disease. Your eye works very much like a camera. The lens at the front of your eye focuses the image onto the retina, which lines the back of the eye. The retina acts like the film in the camera. The image is sent from the retina through the optic nerve and interpreted by our brain. The macula is the very centre of the retina. You are reading this text using your macula. It is responsible for your central detailed vision. It is responsible for your ability to read, distinguish faces, drive a car and any other activities which require fine vision. Your peripheral retina gives you the ability to see general shapes and gives you your 'get-about' or peripheral vision.